It’s Care & Repair Week and charitable body, Care & Repair Cymru, has a simple message for older homeowners up and down Wales. If you are worried about living in poor housing, 'we can help you'. They say that many thousands of older people face housing related difficulties every day ranging from serious disrepair, dangerous electrics and leaking roofs. Thousands more can’t get around their homes, up and down stairs or use basic facilities such as toilets and baths. During the winter months, government figures show that thousands more are hospitalised or even die because they live in cold homes, and are too afraid to turn on the heating because of the cost. Our message to older people for Care & Repair Week is that if you are living in poor housing and want some help, they can help you. Telephone 0300 111 3333 anywhere in Wales to be connected to your local Care & Repair Agency, or you can visit www.careandrepair.org.uk for lots more information about Care & Repair. 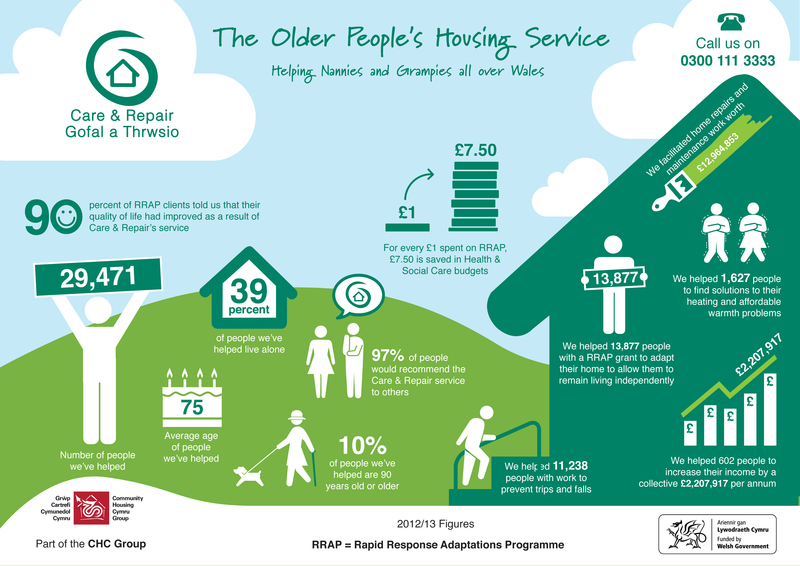 You can view Care & Repair Cymru's new infographic and video for Care & Repair Week below. Please feel free to share on your social media sites, using the #crweek14 hashtag.